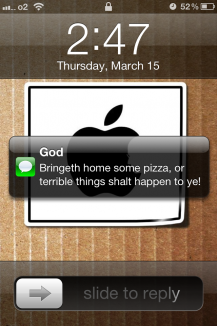 Text from God: "Bringeth home some pizza, or terrible things shalt happen to ye!" - That could be the text you'll send to your mom, while she's shopping. 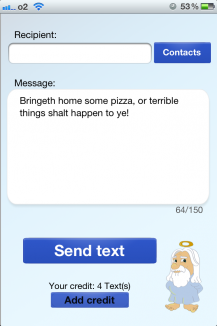 With this great app you can send texts on the behalf of God! The recipient gets your text and is shown, the sender is God. He won't be able to trace back the origin of the message. To test, we'll give you the first text message for free! You won't be charged anything, nor will you have any obligations or commitments. After that, you can purchase 10 texts for only 2.49€, to send in the name of the Lord.